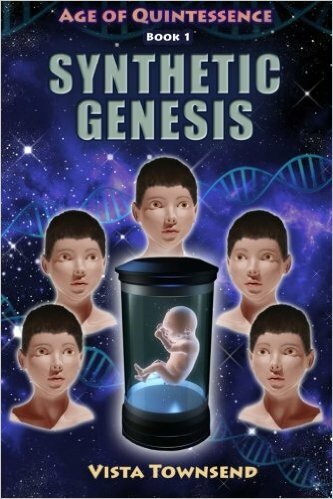 Vista Townsend splices a story about genetically engineered beings. Are they monsters? What do they really want? Layla Rangan is a profectus, a genetically engineered hybrid between humans and an alien race called the ediethians, making her more intelligent at an early age then normal human children. When another profectus dies of an ediethian disease, she becomes interested in genetics as a way to try to prevent such deaths. But her interest in genetics soon goes beyond that, and she begins looking at ways to splice gene fragments from many different species together to create a near-perfect sentient species, and when she succeeds at creating a handful of these being, they are called the quintessence. The story early on connects with the story of Frankenstein. This is a book that Layla reads and thinks about several times. Unlike Dr. Frankenstein, who sewed together body parts to create his monster, Layla does her sewing at a more basic level, the genes. The quintessence are not so monstrous to look at, and they begin life in a similar way as human children, but they mature more quickly. And the non-human genes give them other abilities, which are explored a little in the story. Questions of the personhood or property-hood of the quintessences are raised as they grow older. Because Layla did her work on the quintessence while employed by a large genetics company, the quintessence are essentially company property. Some in the company are unhappy with such manipulations, and want to have the research ending, which would mean culling the quintessence. As the quintessence mature and become able to act on their own, concerns rise over how they should act and consequences for violating a code of conduct, especially when it becomes plain that they are not morally perfect beings. A further concern is raised when Layla balks at her creations being trained as possible fighters, especially when the quintessence themselves find the training and work fulfilling. And, finally, there is a bit of something else that kind of surfaces briefly a few times in the middle and end, like a shark’s fin on the open sea might appear for a few seconds before disappearing. It’s the idea that the quintessence themselves are playing a very long game with the powers around them, that they are not simply being manipulated by the rulers of the empire, but have their own agenda and ambitions. This is an ambitious story, one that looks at some interesting issues. There are two connected concerns in the story that I wish had been done better. One is that I didn’t get much of an impression that this was a far-future setting. The other is that I rarely got the impression that this story was set in an empire made up of numerous world and alien races. One way this shows is in travel between planets and solar systems. When Layla travels from her home planet to the place where she’s doing her university studies, or goes from there to the planet where she being her work, it’s treated almost as if she simply hopped on a bus or a plane today. We are told little or nothing about, for example, the types of ships civilians might use in space travel, or whether people on the ground have to take shuttles up to orbiting stations and then board the crafts designed for space travel, and things like that which interest a minor sci-fi guy like me. How is warp travel achieved? What about relativity? Are there things like warp gateways, space pirates, maybe even wayside stops in space set along known travel routes? As well, there is a time when Layla exchanges messages with another profectus living on another planet. It seemed a lot like e-mail, but it was sent to someone in another solar system. What was the technology that allowed the information to travel so quickly from one planet to another? It had to involve faster-than-light travel. I’m not asking for hard science, because we don’t know what such travel would be like in real life. But it’s a rich place to let one’s imagination run a little. Outside of a few chapters about Layla’s ediethian friend Roobaroo on her home world, the rest of the book is set on human worlds and filled with human or human-like characters. Even when Layla travels to several worlds late in the story, they are either skimmed over or come off as normal human worlds. I could point out examples like the Eldar craftworlds in Warhammer 40K, wretched hives of scum and villainy like Mos Eisley or Deep Space 9, extreme environments like Arrakis, or the isolated grandeur of Cloud City–all examples of what I was hoping to find more of in a large sci-fi empire like this one seems to be. If Layla is in any way religious, it’s a kind of cultural Hinduism related back to her human genes being Indian and the family that raised her also being descended from people from India. One or two of her friends at work are Christians. The ediethians seem to have a priestly caste, and a priestess mentions a Divine Light one time. But any human or alien religion is little explored. Churches come up in regards to weddings, but that’s about it. There is some consideration of God in regards to some philosophical questions, such as if man should play God by creating new beings. If I were to rate this story on a scale of 5, I’d probably give it a 3. There is good stuff here, and some interesting questions to ponder on. There are also some serious weaknesses, too, especially for readers who are already familiar with sci-fi universes. And it could use some more editing, as I noticed several spelling and grammar errors. It’s a solid story, but not great. As this looks to be the first in a series, I hope the author can improve on the alien sci-fi aspects in later stories.